“Secretary Tillerson’s warped notion that it’s appropriate to attend and accept an award at an oil industry conference proves yet again that he has no idea how to be the United States’ chief diplomat,” said Greenpeace USA senior climate campaigner Naomi Ages. Tillerson spent more than 40 years working in the fossil fuel industry before he was confirmed as President Donald Trump’s secretary of state—in “a vote for climate disaster,” as 350.org’s May Boeve described it—earlier this year. He left ExxonMobil to lead the State Department just before being forced to retire from the company due to his age. 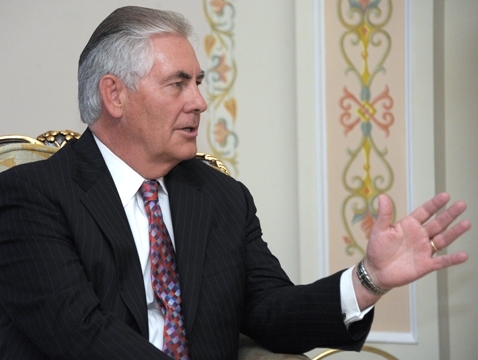 Tillerson…is being recognized for his “outstanding contribution to the oil and gas industry” with the highest honor of the World Petroleum Council, the Dewhurst Award. This distinguished lifetime achievement award celebrates his exceptional leadership of the largest publicly traded oil and gas company in the world over the past 10 years. Tillerson is only the tenth recipient of the Dewhurst Award in the history of the WPC. After the ceremony, Tillerson met with Turkish President Recep Tayyip Erdoğan, before heading to the Gulf Monday for talks with the four nations embroiled in a major diplomatic dispute with Qatar. Prior to Tillerson’s trip to Turkey to accept the award, he visited the Ukraine and attended the G20 Summit in Hamburg, Germany, where he was the only U.S. official to accompany Trump to the president’s infamous first meeting with Russian President Vladimir Putin on Friday. Putin and Tillerson have a long history from Tillerson’s days working for Big Oil. The Russian president gave Tillerson an Order of Friendship award in 2013 when, as ExxonMobil CEO, he signed a drilling deal with Rosneft, Russia’s state-owned oil company. The deal was later put on hold due to U.S. sanctions enacted after Russia annexed Crimea, reportedly motivating Tillerson to visit the White House several times to lobby then-president Barack Obama to consider the cost of the sanctions. In April, Common Dreams reported that ExxonMobil had applied for a waiver from the U.S. Department of Treasury to bypass sanctions to resume drilling with the Russian company. Rex Tillerson, as secretary of state, recused himself from all government decisions involving ExxonMobil, and the department denied ExxonMobil’s request.